Summing up this retailing success story in just a few pictures. Home Depot (NYSE:HD) is one of the most successful national retailers on the market, with sales growth holding near 6% and earnings spiking by double digits. A multiyear recovery in the housing market is a big driver behind that impressive result. But there's much more to Home Depot's business than simply selling more power tools to home owners. Below are a few charts that neatly sum up the scale of its awesome operating and financial wins. Home Depot's comparable-store sales surged higher by 6% last quarter, besting Lowe's (NYSE:LOW) 3% uptick. This isn't just a recent phenomenon, either. 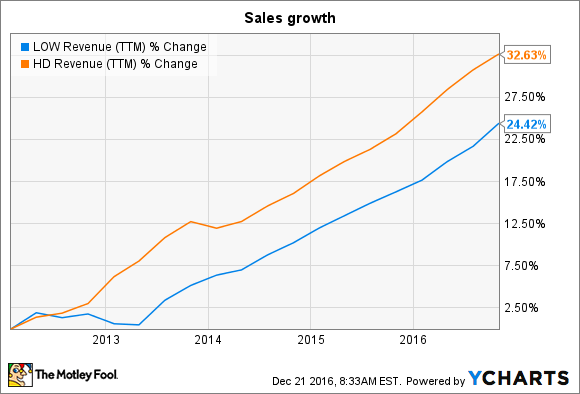 The retailer has trounced its smaller rival on this core metric for several consecutive years. As a result, its overall sales growth pace beats Lowe's, even though Home Depot isn't building new stores while Lowe's is aggressively expanding its store base. Home improvement spending pace. Image source: Federal Reserve Economic Data. The business is heavily dependent on the health of the U.S. housing market, which helps explain why both Lowe's and Home Depot are doing well right now. Home improvement spending has rebounded from a low of $375 billion in 2010 to a $700 billion annual pace today. The industry is still below its peak of $900 billion set just before the housing market crash. 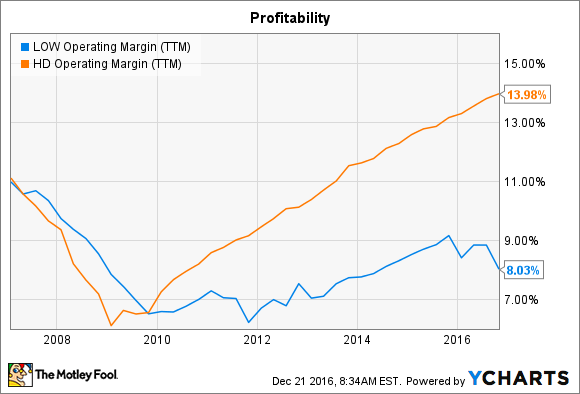 LOW Operating Margin (TTM) data by YCharts. Home Depot is grabbing far more than its fair share of profits, as operating margin weighs in at 14% of sales, compared to Lowe's 8%. The company is targeting close to 15% profitability by 2018 when it should also be clearing over $100 billion in annual revenue. Image source: Home Depot investor presentation. With its recent purchase of Interline Brands, Home Depot deepened its push into the professional side of the business that's nearly as big as the consumer segment it currently dominates. Pro customers are the main factor behind the company's market-thumping growth lately. Large transactions totaling $900 or more spiked by double-digits last quarter to help completely offset a minor slowdown in overall customer traffic. Tacking on additional market segments gives Home Depot a huge, $550-billion sandbox to play in, which provides plenty of room for executives to expand on its current $90 billion annual sales pace. HD Net Income (TTM) data by YCharts. Home Depot is on pace to grow earnings per share by 16% this year to roughly match 2015's impressive pace. For a little perspective, consider that the $3.5 billion it will pay in dividends in 2016 (equating to 50% of earnings) is about equal to the company's entire profit haul just five years ago. 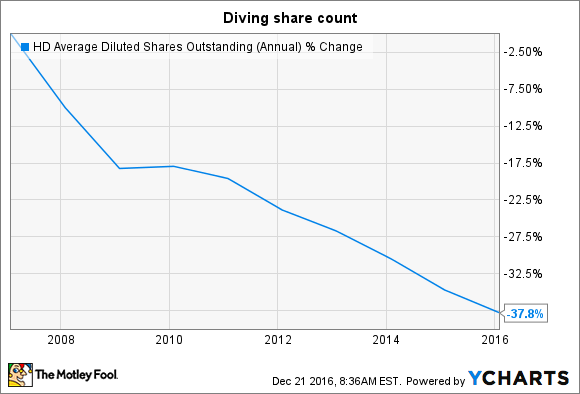 HD Average Diluted Shares Outstanding (Annual) data by YCharts. In addition to a growing dividend, Home Depot returns cash to shareholders through aggressive stock buybacks. It will spend $7 billion reducing its share count in 2016 alone. Over the last decade of consistent stock repurchasing, the company has removed more than one-third of its stock, which has allowed per-share earnings to greatly outpace the rise in overall earnings. 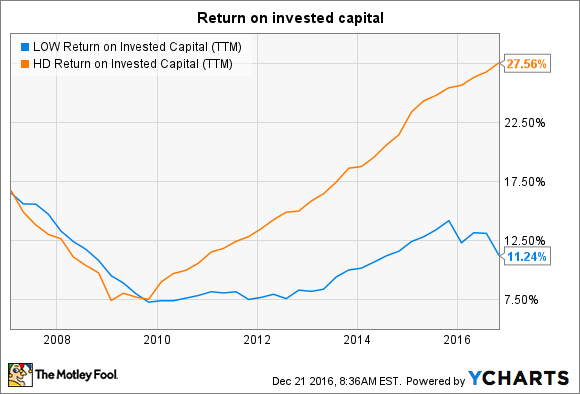 LOW Return on Invested Capital (TTM) data by YCharts. Home Depot's 27% return on invested capital (ROIC) not only far outpaces Lowe's result, but it also makes the retailer one of the most efficient companies on the entire stock market. CEO Craig Menear and his executive team, through smart debt, business investment, and capital return strategies, have proven themselves to be excellent stewards of shareholder cash. The company should see this figure improve even more over the next few years, as executives predict an ROIC of around 35% by 2018. 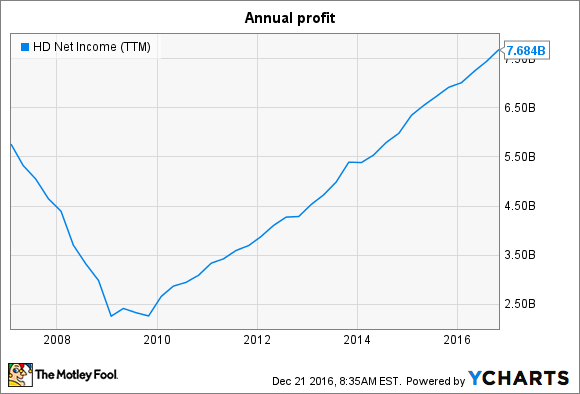 Home Depot's stock price chart in 2016 doesn't seem to match up with the above operating and financial wins. Shares are trailing the broader market by about 10 percentage points, which could set the retailer up for strong gains ahead as it pushes past $100 billion of annual sales.